Do you want to convert the Audio on your Computer in WAV Format? Extract Audio from video files? Easy WAV Converter App simplifies the whole process to a few mouse clicks! The App supports the following audio formats as Input: mp3, mp4, M4A, wav, AIFF, caf, mp2, mp1, aac, au, m4r, ts, mov, qt, mpg, 3gp, ac3, m4v, bwf, 3gt, vob, amr, 3ga, awb, au, snd, adts and m4b formats. You can convert an unlimited number of files at the same time. For this, add as many files in the App window as you like. You can play any of the files in an embedded Player before you convert them. The unnecessary files, you can remove at any time from the conversion list with one click. If you want to customize your results, go to settings. You can set the sample rate from low to high quality. Select the Bits per Sample and number of channels. And define what the App should do after the conversion of the files, e.g. play Sound, and / or display the destination folder with the converted files in the Finder. Features include options for volume Normalization, Fade In & Fade Out, and Removing breaks and styles at the Start and end of each audio track. And now for the easiest step: Press “Convert” Button to Convert and create a WAV-files! 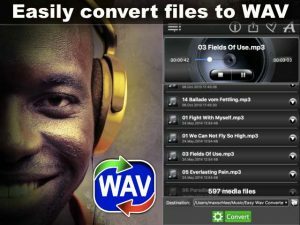 Download Easy WAV Converter now and take advantage of this really easy way to convert audio files in WAV Format! Hello everyone together and welcome to our new App “Easy WAV Converter”. This App will convert your audio files of different formats with professional sound quality to WAV Format. It supports 28 different audio formats, such as mp3, mpg, aiff and more. For a complete list of supported formats, see the App’s description. With this App, you can also extract Audio from video files. The Great thing about Easy WAV Converter is that it doesn’t matter if your audio files are in the same or in different Audio formats, are recorded with different or the same sound quality or have different volume levels. Just drag them all into the App window and the App will convert them all to WAV Format. Do you want to play your files before you convert them? No Problem Easy WAV Converter comes with an integrated Player. Simply click the button with a note Icon and listen to the Audio Track. If you find an Audio file that you do not want to convert, then Remove it with a few clicks! At the bottom of the App window, you can specify the destination folder for your converted files! Now we go to the settings of the App. There you can adjust the sound quality from low to high. You can also set sound channels and Bits per Sample. If your audio files were originally recorded at different volume levels, you can normalize the volume. You can also add Fade in and Fade out effects and remove the silence and pauses at the beginning and end of the audio tracks. Are you ready? Then click on Convert Button and let Easy WAV Converter do the hard work for you! Here are the new WAV files! Download Easy WAV Converter now, download and try the App for yourself!